Earlier, the firm said April '15 sales of nontraded REITs and other investments were up from their November '14 lows. 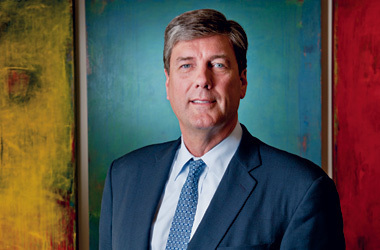 Bill Dwyer leads Realty Capital Securities. RCS Capital (RCAP), which includes the Cetera Financial Group of independent broker-dealers, said Thursday its equity sales dropped 54% in the first quarter of 2015 from last year to $1.1 billion. Its adjusted net income fell 54% as well to $17.4 million, or $0.19 a share, from $38.4 million, or $0.44 a share, in the first quarter of 2014. On a pre-adjusted basis, the company reported a net loss of -$13.5 million, or -0.14 a share, vs. a net loss of -$7.4 million, or -0.09 a share in the year-ago period. Total revenue was down 8% year over year to $625.6 million in the period ending March 31. The company says it recruited 823 financial advisors added in the first quarter, including advisors brought on via the purchase of VSR and Girard Securities; beyond acquisitions, 345 financial advisors were recruited in the period with $38.1 million in yearly fees and commissions, which the company says is 160% higher than the production level of advisors who left the platform. The firm notes it had $23.5 million in net recruited production in Q1’15 vs $20.9 million in Q4’14. Its broker-dealer operations are led by CEO Larry Roth and President Adam Antoniades. On Tuesday, RCS Capital said its wholesale broker-dealer subsidiaries, Realty Capital Securities, SC Distributors and the Hatteras Funds, raised $457 million of total equity capital in April. Sales of direct investment programs for the month were nearly $430 million in April, an 85% increase from November 2014 sales, according to the company. Realty Capital Securities’ distributed nontraded REIT programs – including American Realty Capital Trust Global, American Realty Capital Trust V and American Realty Capital Healthcare Trust II – were hurt by news in late October that American Realty Capital (ARCP) had $23 million of accounting errors, which prompted a number of broker-dealers and other entities to stop selling American Realty Capital products. The three American Realty Capital nontraded REITs are being listed on a national stock exchange during the second and third quarters of 2015. RCS Capital also announced recently that Steven Neamtz joined the company as national sales manager for Realty Capital Securities. He has 32 years of distribution experience and used to be president and chief executive officer of Convexcel Asset Management and Vest Financial, in addition to having held senior leadership and executive management roles with American International Group (AIG) and Natixis.